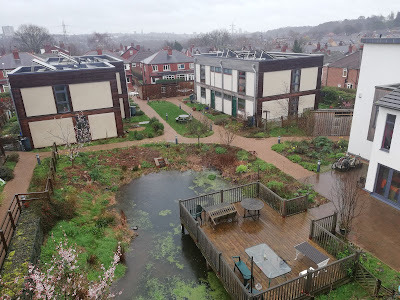 Yesterday I had the good fortune to find myself at the Low Impact Living Affordable Community (LILAC) over in Bramley, Leeds. It was, and I really don't think I'm exaggerating here, paradise. 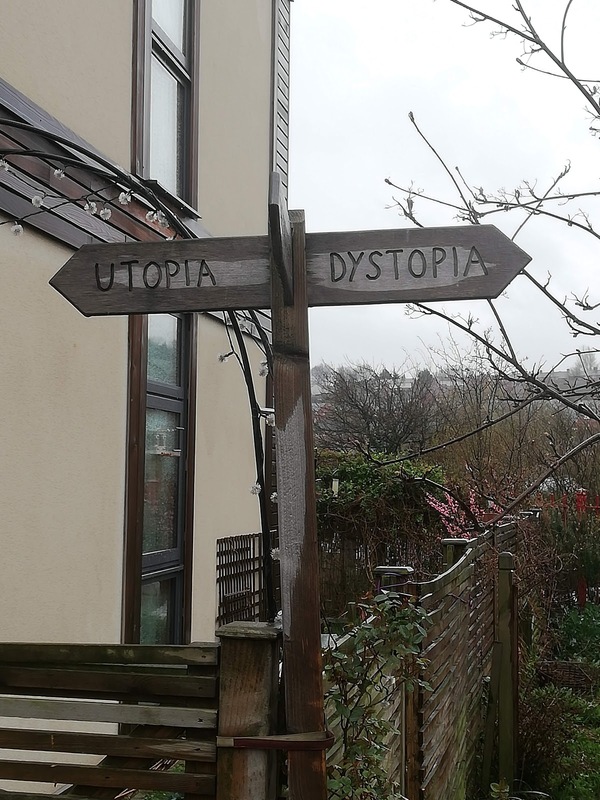 This is exactly the sort of place I want to live in, and to be. It's hard to do it justice with words and pictures alone - and not only because of day's briefly punctuated torrential downpours - but because more than this being a superbly conceived and realised architectural-permacultural marvel, it felt in every sense that I understand the word, like that thing that can't adequately be pictured or described, that thing missing from most of our lives: community. The people who lived there, so open and welcoming, appeared genuinely happy. It's not often you meet genuinely happy people. They've clearly found a way to live that really, humanely, works. That's a very special thing indeed. In the picture above you can see the community's central pond, viewed from the balcony of one of the residents kind enough to show us into her home (the site, about 0.8 hectares, accommodates approximately 30 homes, mostly one and two bed "flats", and a number of three and four bed family sized homes). All are currently occupied or accounted for, and many of the original founders of the community (who first moved in 2013, but whose work on the project began back in 2006) still live there today. Let's take a closer look at the pond. Its centrality in the space isn't a coincidence or an accident, but a feature. It provides a focal point for the community: a shared space, surrounded by abundant plant and wild life that all members of the community contribute towards maintaining, alongside garden and allotment spaces of their own. 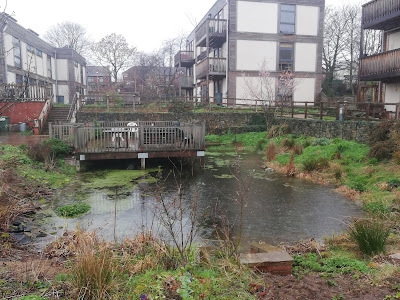 On this occasion at least three residents seen pottering around commented with delight on the return of the ducks (just a pair today, but a sign of more to come). I've never seen so many people so happy just to see pair of ducks. This fact on its own, I think, tells you everything you need to know about LILAC and the people who live there). Other, more subtle, elements that foster community and joy are built into the design of the place. Car parking spaces are positioned at the edges of the site, such that it's not possible to park directly in front of your home, walk straight up to your front door and slip inside without running the risk of bumping into a neighbour or two. Bumping into neighbours is encouraged, and facilitated simply by the design of the space itself. Community blooms effortlessly. Even the introverts (hello) come gladly out of themselves. There's a "common house" where the residents meet a couple of times a week for shared meals, and where a lot of the day's learning and participating took place. Again, this is in a central spot, adjacent to the pond, and feels naturally welcoming, inclusive and happy. 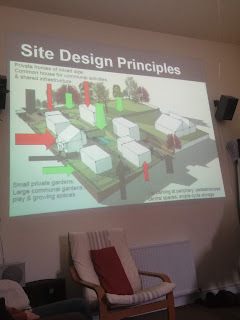 Residents pay a portion of their "mortgage" (more on that shortly) towards the upkeep of the common house and other shared spaces. It belongs to no one, and to everyone. It's socialism lived, not merely idealised. After a morning's light volunteering and a guided tour, we were treated to a presentation in the common house, explaining some of the principles and design ideas behind LILAC in more detail. 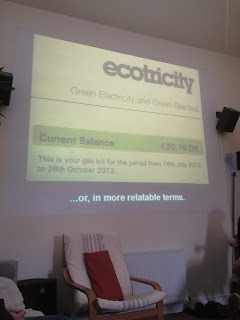 That second picture there - that's a resident's quarterly energy bill (from summer 2013). Yes, it came to £20.15 for three months. This time of year, in my privately rented one-bedroom flat, I'm paying about £30 a week. 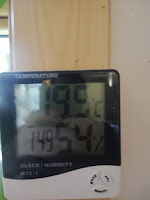 The building design and use of passive solar heating, along with other "low impact" technologies, keeps costs almost unbelievably low and hence, actually affordable - not just "affordable". The buildings themselves are constructed out of straw bales, which are not in any way as flimsy or chilly as they sound. The straw provides thick walls, and excellent insulation. Inside a large kitchen-living space in one of the four bed homes, with radiators off, the room temperature was steady 19.5 degrees Celsius. It was at least ten degrees colder than that outside. The windows are tripled glazed and the entire building is, too all intents and purposes, hermetically sealed. The homes feel cosy, spacious, earthy, alive and once again, happy. Nobody seemed to know for certain how many children lived in the community altogether. Somewhere between 8 and 12 was the rough consensus. "It takes a village to raise a child" - another dream, made real. 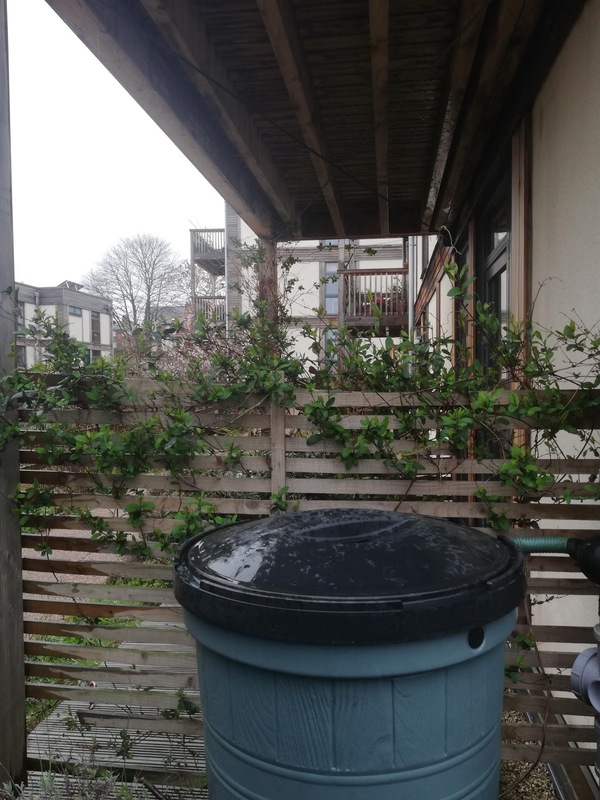 Most homes are fitted with water buts to collect excess rain water for use on the garden in the summer. All are fitted with at least some solar panels (accounting again for the extraordinarily low energy costs). Outside again, the allotments. I'm becoming something of a gardener myself these days, but couldn't begin the guess at the abundance of edibles and other plants flourishing all over the plots. LILAC is a "Mutual Home Ownership Society" and if you haven't heard of one of them, don't worry; there aren't many of them about. In fact, LILAC is the first one in the world. It's incredible there aren't a lot more of them, since they look to me like the solution to so many problems: isolation and lack of community, "affordable" housing, sustainability, self-sufficiency, and on, and on. The model allows you to buy the rough equivalent of "shares" in the community, whose value is linked to national average earnings (which despite economic turmoil, remain comparatively steady, relative to the wilder fluctuations of the so-called "housing market"). If you choose to leave the community, you sell your shares back to them, at no loss. I wish I was informed enough to understand this sort of thing, but I hope that will come with time. It certainly seems right. I came away with not a single negative thought about the entire concept and experience. They really seem to have thought of everything. This is the sort of world I want to live in. Utopia, indeed. Feeling good this morning because I've made it up to a total of 50 YouTube subscribers. Turns out the gardening/allotmentiering YouTube space is a vibrant and friendly one. It's also the first day of a two week stint of "annual leave", as the working world likes to term it. Time when you don't have to go to work, but they still give you money anyway. Really, what all the time should be like, but never mind about that just now. 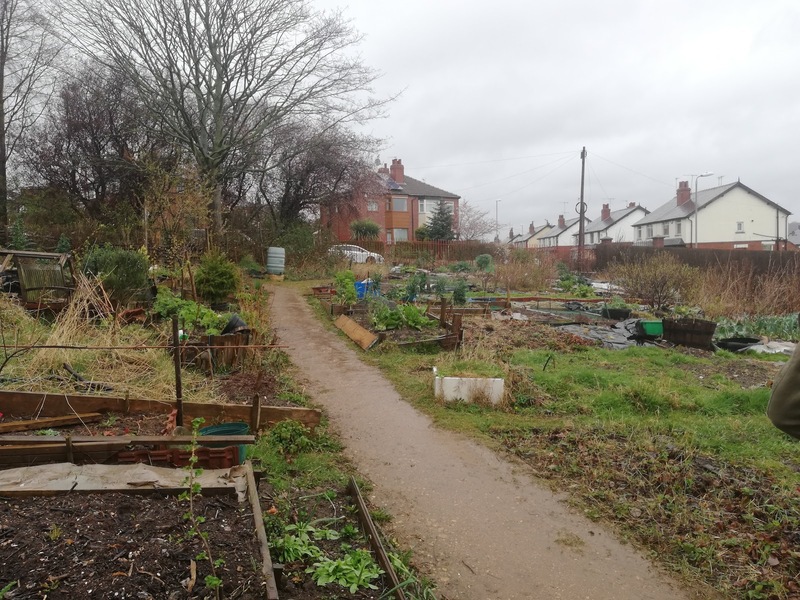 What matters is that this week and next, I will be spending as much time as I can on the allotment. IN and amongst the digging and the being, I will also be making some videos, which you will be able to watch on my channel, which you can find here or of course, by clicking on the big red YouTube button at the bottom of this page. I'm thinking of changing the name of the channel to something other than just my own name, and then maybe separating my allotment videos from other crap I occasionally throw up there, but that's maybe for a little later. Maybe when I get 100 subscribers (imagine that). In the meantime, if you're here for the gardening stuff, my regular videos, my "Allotment Scraps" are here. Peace, love and happiness to all.